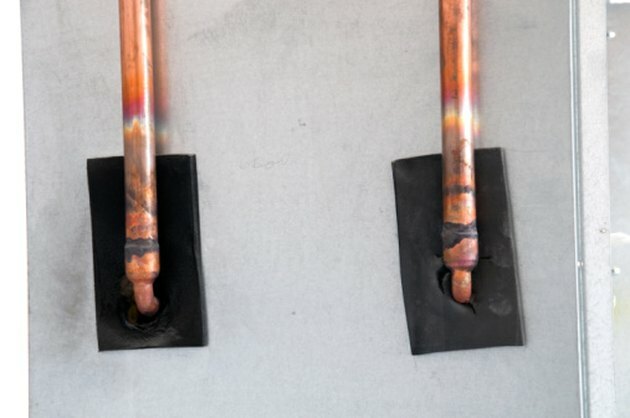 Copper pipes and other copper parts can be soldered using various metals with low melting points. Traditionally, lead alloys have been used for soldering copper, but these have fallen from favor in recent years due to lead poisoning concerns. Today, copper water pipes are soldered with lead-free flux and silver alloys. Lead alloys are still used for soldering wires, components on circuit boards and some other copper-joining applications. Regardless of the alloys used, the techniques remain basically the same. Clean the outside end of the copper pipe with a piece of emery cloth until it is shiny bright. Clean the inside of the copper fitting with the fitting brush. Brush generous amounts of flux onto the end of the copper pipe, coating the entire circumference. Repeat for the inside of the copper fitting, covering the entire surface the pipe fits inside of. Insert the pipe into the fitting. Light the torch and heat the fitting evenly. Occasionally touch the silver solder to the juncture of the fitting and the pipe. If it begins to melt, continue applying solder around the entire joint. Continue heating the joint for a few seconds. Turn the torch off and allow the joint to cool for a few seconds until the solder begins to harden. You'll see the solder change from a shiny surface to one that is duller and similar to the unused solder on the roll. Gently wipe the joint with the wet rag to remove the flux. Clean solid wire with emery cloth and remove any enamel if it was used to coat the wire. Clean pads on a circuit board with a pencil eraser. Make the connection by twisting wires together or inserting the wire into a hole on a circuit board. Stranded wire can't be cleaned -- in this case, you'll need the soldering iron. Apply a small amount of rosin-core solder to the soldering iron tip. The iron is hot enough when the solder melts when you touch the solder to the tip. In the case of stranded wire, use the soldering iron to heat the strands and melt a little rosin-core solder on them to make a solid wire end in preparation for the connection. This is called tinning. Begin heating the connection with the soldering iron. Occasionally touch the solder to the connection; when it melts, continue applying a little solder until the connection is covered. Remove the iron from the connection and return the iron to the holder or stand. Let the connection cool entirely before touching the wires.